There’s nothing quite as retro-futuristic as the Philco Predicta television from the late 1950s. That bubbly, detached picture tube. The metal frame. It’s gorgeous. 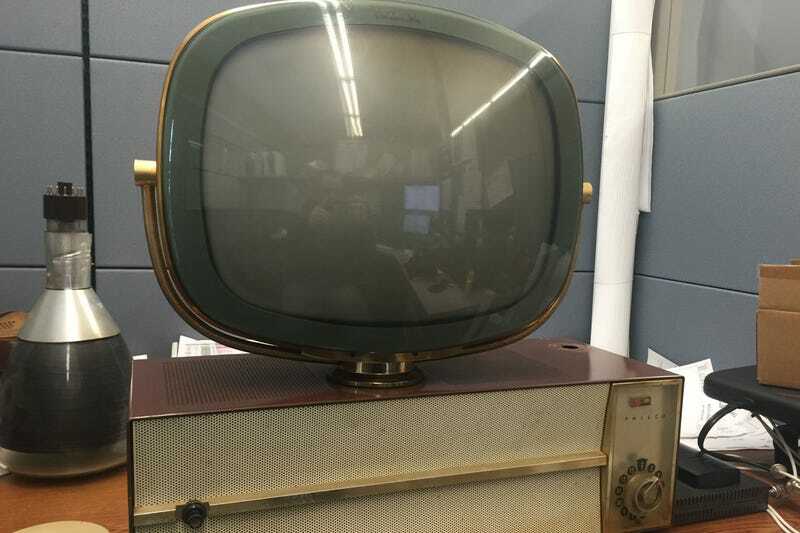 Unfortunately, the iconic TV set is also notoriously unreliable—and what good is a broken Predicta TV? Well, it turns out it makes a pretty bitchin’ monitor frame. Redditor Imapm (or “ModularDuck” if you go by his Imgur handle) painstakingly dragged a busted up Predicta into the modern era, outfitting it with an LCD monitor's modern inputs. But before he did that, he had to take it apart. There’s a lot of stuff here, but Imapm said he was able to use the gutted space to store the new display’s power supply and a small DVD player. The new 15-inch 4:3 display just barely fit inside the Pedicta’s old frame. Even so, it’s technically smaller than the TV’s original display: Imapm had to build a mask to frame the LCD. A hole in the back of the set’s old display is just wide enough grant casual cess to the new TV’s ports.